Do you like retellings? How does this one sound to you? What book are you eagerly awaiting this week? This looks and sounds so good. Just added it to the wishlist. I'm such a fan of retellings, and I don't feel like this one has been done before. Thanks for stopping by! I'm such a pushover for retellings, so had to try this unique one! Or hope to try it anyway. Thanks for visiting! Wow, great pick Lisa! This sounds like so much fun. I love stories where a modern day character finds themselves in the past. I really enjoy your blog. I love your header too. 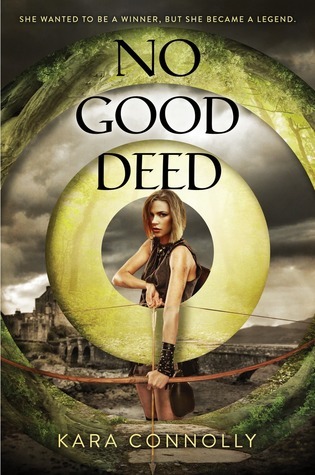 Since I love Robin Hood, I think this one is going onto my TBR list. Thank you so much! I love hearing that! This does sound like a great one. Thanks for visiting! This is the first time I have seen this one and it looks so good. When I first saw it I was instantly intrigued. Thanks for stopping by! Whaaaaaat? How had I not seen this book before? It looks and sounds awesome! Who is the publisher? I hope you enjoy this book when you get the chance to read it! It's Delacorte Press. I found it on Edelweiss, just scrolling through their new review copies that were available. Thanks for visiting! This is the first time I've seen this book. I think I might like reading this! It does sound good! Thanks for stopping by! Oooh! A female Robin Hood! Sounds interesting! My very thought! Thanks for visiting! Oh hello, how cool is this! Great find, Lisa! Robin Hood and King Arthur, are two of my favourite stories! I know! It sounds like so much fun! Thanks for stopping by! OMG!!!! HOW is it that I had not heard of this AWESOME book?! But no, I hadn't.... What a TERRIFIC pick, Lisa!!! KUDOS to you, girl!! I have always loved the Robin Hood stories, and wanted to belong to his group of merry outlaws myself! Lol. But heck, I wanted to be an ACTIVE Maid Marian! Lol. Doesn't it sound awesome! I am so glad to be sharing it with my fellow readers. Hope you are able to get it soon too. Thanks for returning the comment! I love retellings and this one sounds interesting. Hope you love it! This sounds like a unique one for sure. Thanks for stopping by! I'm with you on the crazy busy! Thanks for stopping by! !